Upcoming sci-fi series 12 Monkeys, inspired by the hit film starring Brad Pitt and Bruce Willis, will premiere on the Syfy channel at 8:30pm Thursday, March 19th. The cast stars Aaron Stanford as time-traveler Cole and features Amanda Schull (Dr. Cassandra Railly), Kirk Acevedo (Ramse), Barbara Sukowa (Jones) and Noah Bean (Aaron Marker). Additional key recurring roles include Tom Noonan (Damages, Hell on Wheels) as a mysterious villain and Emily Hampshire (Rookie Blue) as mental patient Jennifer Goines. The series is produced by Universal Cable Productions in association with Atlas Entertainment, producer of the original theatrical film. Charles Roven (American Hustle, Man of Steel, The Dark Knight Trilogy), who served as producer on the original film. will executive produce with Richard Suckle (American Hustle, The International). It premiered in the US in January. I’ve watched 5 episodes of this on Hulu and I have to say I’m finding it very enjoyable, it is a cut above the normal production of a SyFy show and is something I look forward to each week. 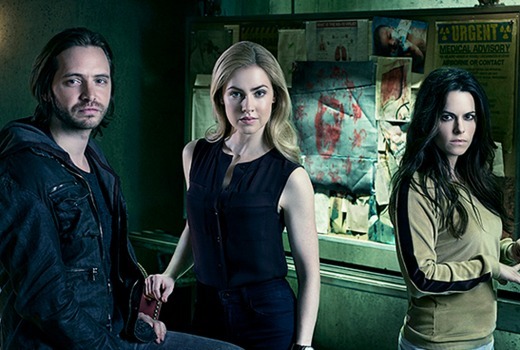 It’s great to see Amanda Schull in a full-time role as I enjoyed her in parts in Suits as Katrina Bennett, also Emily Hampshire is great as Jennifer Goines, I wondered how they would go with the Brad Pitt part but she knocks it out of the park. As a Terry Gilliam fan I was hesitant at first seeing he isn’t involved, however by the end of the first episode it didn’t bother me at all, my hesitation had faded away. For a story that started out as a French short film ( La Jetée), it still has a lot to tell even after being made into a motion picture.